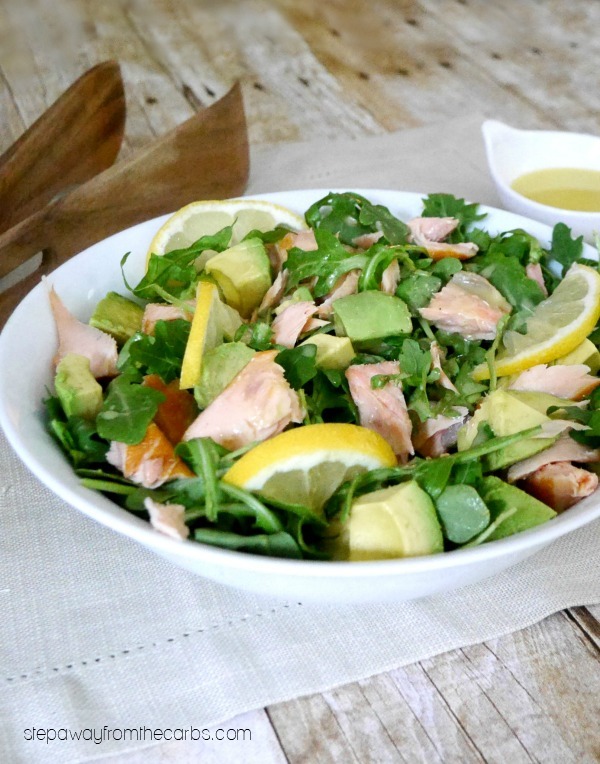 This salmon, avocado and arugula salad is served with a delicious lemon dressing. 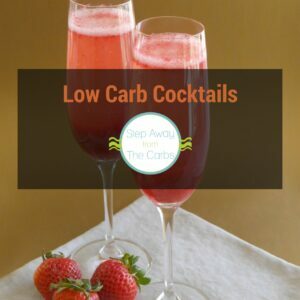 Low carb and keto recipe. If you’re looking for a tasty salad with great contrast of textures but a fantastic flavor combination – try this! The slight oiliness of the salmon works perfectly with the pepperiness of the arugula (also known as rocket! ), and the creaminess of the avocado. The lemon dressing brings everything together! Serve this salad as a filling lunch for two people, or as an appetizer for four people. I shared it with my husband for lunch recently on a really hot day – and it was ideal! 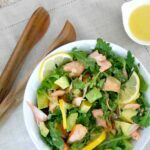 A great aspect of this salad is that it comes together pretty quickly – especially if you use a pre-cooked smoked salmon fillet like I did. You can prepare the dressing in advance if necessary, plus cook and cool the salmon if you can only buy raw. Then assemble the salad just before planning to eat, to make sure that the avocado is perfect! To make the dressing, combine extra virgin olive oil, lemon juice, white wine vinegar, Dijon mustard and black pepper in a jug or bowl. Whisk it vigorously together until it is emulsified. To make the salad, add arugula leaves, flaked cooked salmon, and a diced avocado (you want it ripe, but not TOO soft for this salad otherwise it will get too mushy). Gently toss everything together, then drizzle a little of the lemon dressing over the top, leaving extra for guests to add as necessary. 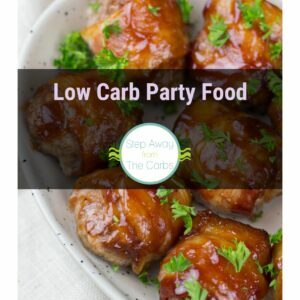 If you would like to see more summery low carb recipes – check out my guide to the best Low Carb Summer! 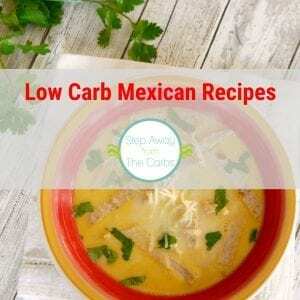 This low carb and keto salad is perfect for the summer! Serve it as a lunch for two or an appetizer for four! To make the dressing, combine all the ingredients in a jug or bowl. 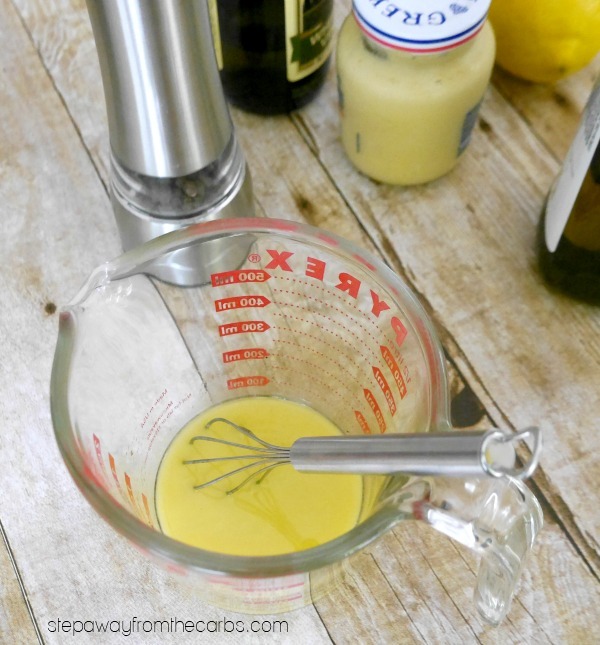 Whisk it vigorously together until it is emulsified. 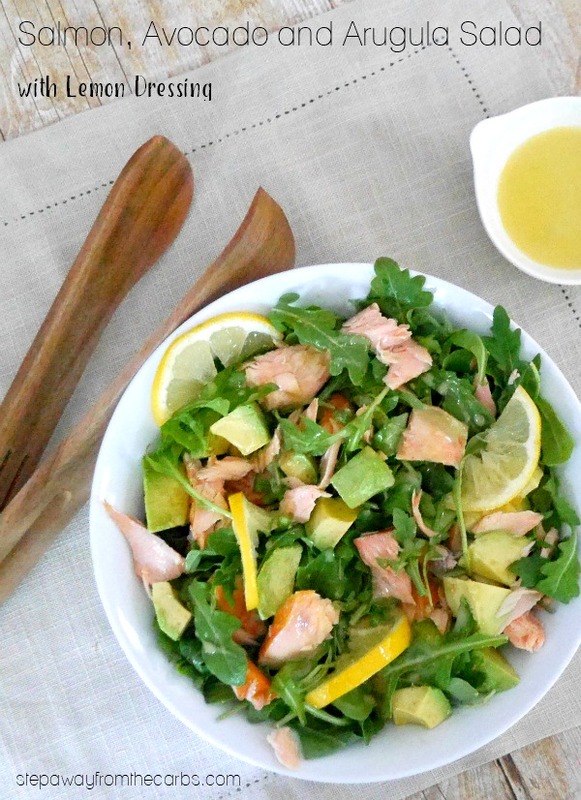 To make the salad, add arugula leaves, flaked cooked salmon, and a diced avocado to a serving bowl. Gently toss everything together, then drizzle a little of the lemon dressing over the top, leaving extra for guests to add as necessary. « 50 Awesome Reasons Why It’s Moon Cheese Time!